A free Partition Magic alternative, Macrorit Disk Partition Expert Home Edition is powerful free partition software allows you to extend partition (especially for system partition), settle low disk space problem, manage disk space easily on MBR and GUID partition table (GPT) disk. For free, forever: It could assist you to solve common disk partition problems WITHOUT ANY CHARGE. Extremely easy-to-use: All tasks could be easily operated, undo/redo/commit operations with several mouse click. 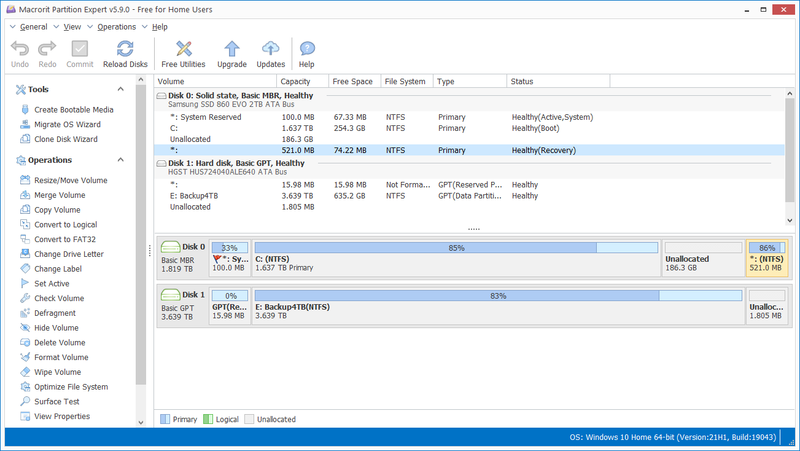 Feature-rich: HASSLE-FREE partition software fixes for your computer common disk partition problems. Macrorit New Technology: Although it is freeware, it possesses all the unique technology of power-off protection and data disaster recovery. Enjoy continual practical features, for free: There will be more practical features added based on users' needs. Wide compatibility: *Support > 2T hard drive , 1024 sector size and MBR/GPT partition. *Support Windows native environment, any partition can be locked. *Support Multi- operating system environment. Fast working speed: The speed to resize/move, copy, wipe, surface test can reach the limit of IO devices. 4,882 8,656 Macrorit Tech Development Co., Ltd <img src="https://www.oldergeeks.com/downloads/gallery/thumbs/macrorit-disk-partition_th.png"border="0"> Jan 22, 2019 - 12:08 5.3.7 13.72MB ZIP , out of 25 Votes.